Colorado’s top Democrat expressed concerns over a ballot measure that would increase the state’s oil and gas setbacks less than a week after his party voted to support the effort. Gov. John Hickenlooper said the proposed increase in setbacks posed a number of problems, including exposing the state to takings claims from private property owners and threatening the retirement of Coloradans. “It would certainly have a huge impact on the oil and gas industry in the State of Colorado,” Hickenlooper said. Hickenlooper’s comments come just a few days after the Colorado Democratic Party’s State Executive and Central Committee voted July 14 to endorse Initiative 97, which would increase the state’s setback for new oil and gas development from building and “vulnerable areas” to 2,500 feet, a five-fold increase. Currently, Colorado requires setbacks of 500 feet from an occupied building, such as a home, and 1,000 feet from schools. 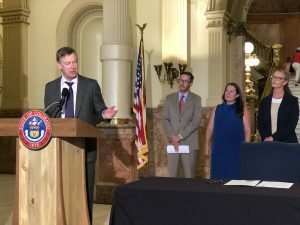 Hickenlooper said he was unfamiliar with the specific language in the proposed setback ballot measure, but expressed concern on the “serious issue” after signing an executive order on orphaned wells. “I’m not aware, I haven’t read that initiative so there might be something in there about orphaned wells,” Hickenlooper said, when asked if Initiative 97 would have any impact on orphaned wells. When asked if he had taken a position on the issue, Hickenlooper demurred, instead raising the question of how placing a large percentage of the state’s non-federal lands—more than 85 percent—off limits to oil and gas development could represent a taking of private property, and how that would affect average Coloradans. “Well I’ve already . . . they had that initiative out several years ago. . . I haven’t looked at the details but the maps I’ve seen when you look at a 2,500 foot setback, it basically would eliminate 90 percent or 85 percent of the oil and gas activity in Weld County. Maybe not quite that much but a significant amount in western Colorado,” Hickenlooper told reporters last week. An analysis by the Colorado Oil and Gas Conservation Commission released in early June estimated that “[i]n Colorado’s top five oil and gas producing counties combined, 61% of the surface acreage (94% of non-federal land) would be unavailable.” In the three western counties in the state’s top five for oil and gas production, more than 99.8 percent of non-federal surface area in Garfield, La Plata, and Rio Blanco counties would be included in the new buffer zone. Candidates aren’t bound by the state party’s positions, but a rift between the state’s environmental activists and mainstream party candidates has re-emerged in the battle over Initiative 97. Central to that debate is U.S. Rep. Jared Polis (D-Colo.), whose gubernatorial run in 2018 resurfaced rumblings of discontent that first emerged in 2014, even before he pulled a pair of ballot measures he backed financially in an 11th hour compromise orchestrated by Hickenlooper ahead of the last midterm election. Polis and Hickenlooper were immediately condemned by anti-energy activists in the state, who expressed a sense of betrayal at the withdrawal of the 2014 ballot measures. “We are outraged to see politicians once again prioritizing political expediency over the health and well being of Coloradans. The proposed compromise represents a failure on the part of both Polis and Hickenlooper to protect Coloradans from the dangers of fracking,” Frack Free Colorado’s Russell Mendell said in August 2014. When Polis spoke to anti-fracking activists in Boulder, Colo. to explain his reversal, he was greeted by an angry crowd which yelled, “You sold us out!” Gasland director Josh Fox was also in attendance that day, seeking answers as to why Polis, who had personally underwritten the 2014 measures, had so quickly changed his mind. High Country News, as with many other outlets, speculated the compromise had more to do with the party’s electoral prospects that year. Shane Davis, who runs the Fractivist blog, ran a change.org petition, blasting Polis for “betray[ing]” the state and the signatures of those who had already supported the 2014 measures. “We watched in horror as you blatantly hijacked Colorado’s democratic process, by throwing out nearly 300,000 signatures for statewide initiatives 88 and 89 that you yourself said were ‘sensible regulations on fracking.’ You represent a district where five communities passed local initiatives that voted ‘yes’ to moratoria and bans on fracking, yet you failed to represent those constituents, your constituents,” Davis wrote in the petition. Those local bans and moratoria were thrown out in 2016 when the Colorado Supreme Court ruled state law superseded local efforts to regulate oil and gas development. “Ah yes, the Dems are going to protect us all,” EBCU wrote sarcastically on Facebook. While all four of the Democratic candidates in the primary opposed the ballot measure, the Sierra Club, which endorsed the 2018 measure, backed Polis in the primary with a $600,000 mobilization campaign aimed at television, mail, and digital get-out-the-vote efforts. In contrast, Conservation Colorado has not endorsed the measure. During the primary, Polis’ position on setbacks sparked commentary from one of the state’s leading anti-energy activists. “The problem with Jared is I’m not sure which Jared will show up,” Xiuhtezcatl Martinez, an environmental activist and plaintiff whose lawsuit is still pending before the Colorado Supreme Court, wrote on Facebook in March. In January at a primary campaign event, Polis said he supported the Colorado Court of Appeals decision in Martinez’s case, and said he would support an effort to legislate the Martinez decision into statute if he became governor. Colorado Rising, the proponents of Initiative 97, have until August 6 to gather the more than 98,000 valid signatures necessary to get on the November ballot. That effort faces an uphill climb, as one of the campaign’s signature gatherers has surreptitiously left the state, leaving workers without pay. “This is yet another debacle for anti-oil and gas groups, who manage to prove every two years why they can’t be trusted with the keys to the Colorado state economy,” Moore said. Industry officials were surprised the party would back a measure that not even its candidates appeared willing to get behind. “Democrats have long prided themselves on supposedly being the party of working people, yet in Colorado they’ve endorsed an initiative that would put tens of thousands of working families across the state out of work,” Dan Haley, President of the Colorado Oil and Gas Association, told Colorado Politics.